Axis Deer Hunts with Guaranteed Shot Opportunity! Axis deer hunts are one of our most popular hunts. These hunts are offered for archery, crossbow, gun or muzzleoader. Since Axis can be hard antlered at various times of the year we offer hunts at various times of the year. Axis deer hunts are one of the most challenging hunts we offer as well. Axis deer are considered by many to be one of the most beautiful deer species. They are one of the most sought after trophies of all the exotic deer species. That is what makes axis deer hunts so popular! Bucks can range in weight from 145-250 lbs. The typical horn configuration is 3 points on each side; a main beam, one secondary point approximately half-way up the main beam and a brow tine. They are considered by many to be the best tasting of any wild game species. Come join us for one of our Axis Deer Hunts! These hunts include guiding, transportation on the ranch and lodging at one of our rustic lodging facilities which hunters continually tell us is some of the best in the industry. This hunt can be combined with other exotic or native species as well. Non-hunting guests can also tag along for the lodging fee only at $35 per person per night. 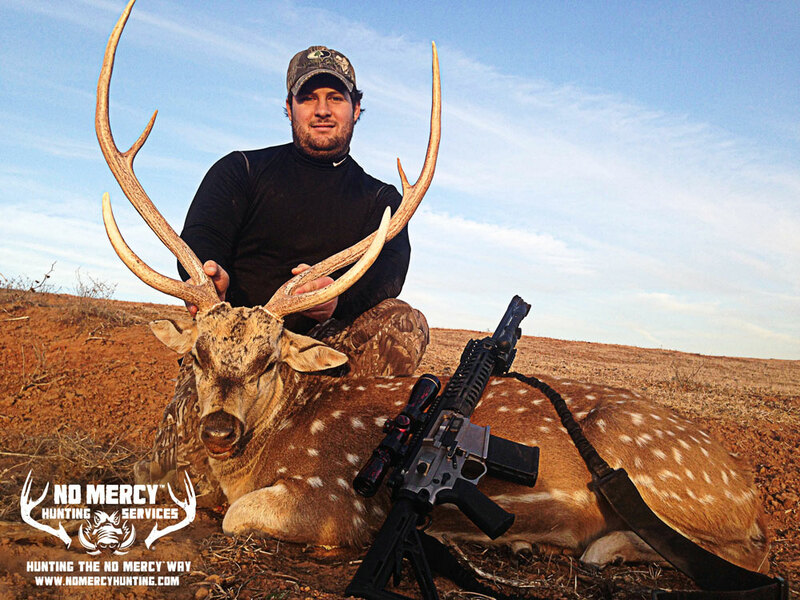 Come see the difference the full service guiding services we offer make on one of our No Mercy Axis Deer Hunts.